Give the gift of 1 Percent this Holidaze Season. Available in denominations from $10 up to $250 and processed in <24 hours. Order by 6p on 12/24 (Xmas Eve) for guaranteed 12/25 Delivery. If you just want the gift card code to deliver on your own then choose "To MySelf". If you want 1 Percent to send a notice directly just choose to send "Directly to Someone Else". As soon as the order is approved they'll receive a very nice email with your custom message. Need to take care of multiple friends? Not a problem as you can send to as many people as you like in the same order. 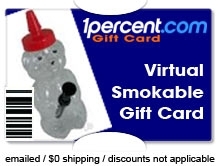 Each Gift Card is redeemable for merchandise online at www.1percent.com. Gift Cards can be used for as many purchases as you'd like until the balance reaches zero including as a partial payment towards the balance of an order. Gift Cards are not returnable, and cannot be used to pay a bill or to purchase another Gift Card. Gift Cards are not redeemable for cash or credit except where required by law. We can replace the remaining value on a lost card # with the original purchase receipt, just contact us. If your Gift Card balance doesn't cover the total cost of your order, we'll charge the remaining amount to your credit card. Gift Cards are charged at the time your order is placed. If the cost of the entire order is lower than the balance on your Gift Card, your credit card will not be charged. Another payment type will only be necessary if the final price of your order is greater than the balance on your Gift Card. Gift Cards usually process and are sent within 24 hours or less. All purchaser billing information must match and usual age verification must be completed first (don't send to someone underage or will be voided). Once order is approved the recipient will receive an email with all the information and the purchaser (if different) will receive confirmation. You can check your Gift Cards Balance anytime through the online form. To redeem your gift card just enter the gift card code when viewing your cart before checking out. Find the area marked Coupon/Promo/Gift Card Code. After entering the code in the proper box press the link Apply Code. The Gift Card credit will be dsiplayed in your total and there will be a confirmation message above your products indicating that your credit was successful. All 1% Gift Cards are deemed purchased in and issued from the State of Delaware. The risk of loss and title to such items pass to the purchaser upon our electronic transmission to the recipient or delivery to the carrier, whichever is applicable. Gift Cards cannot be reloaded, resold, transferred for value, redeemed for cash or applied to any other account, except to the extent required by law. Unused Gift Card balances in a 1 Percent account may not be transferred. Did we mention 1 Percent Gift Cards do not expire? Any questions? Please contact us anytime. It's a gift card. Pretty hard to screw these up. I was able to purchase some extra stuff for my collection and this card was easy to use. Thanks! It only gets better. Sure came in handy for another purchase.